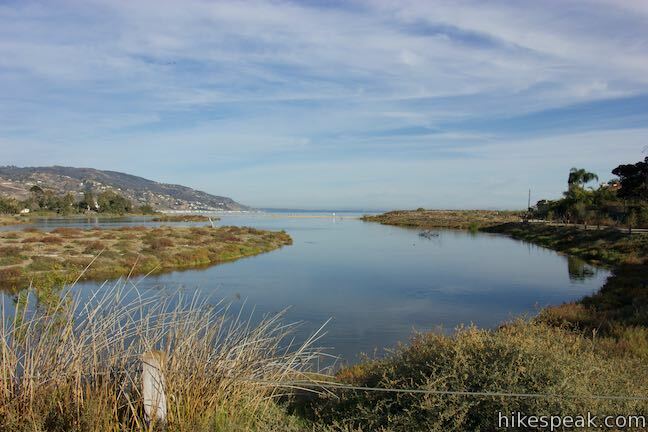 Recently restored Malibu Lagoon State Beach is a lovely place to walk around an estuary and stroll along the beach. 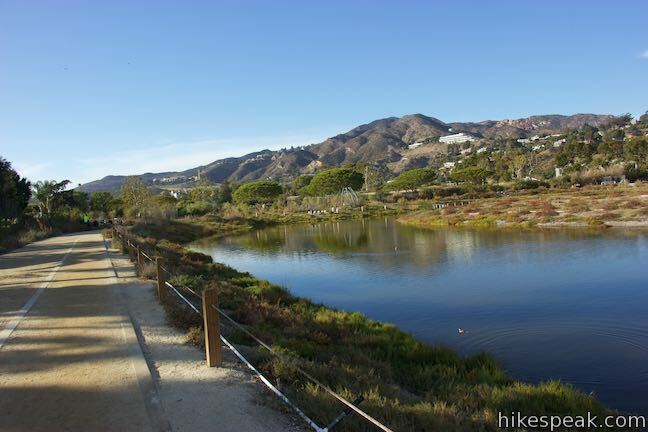 Take a walking path to overlooks around shorebird-filled wetlands and connect to Surfrider Beach, a world famous point break where Malibu Creek meets the Pacific Ocean. 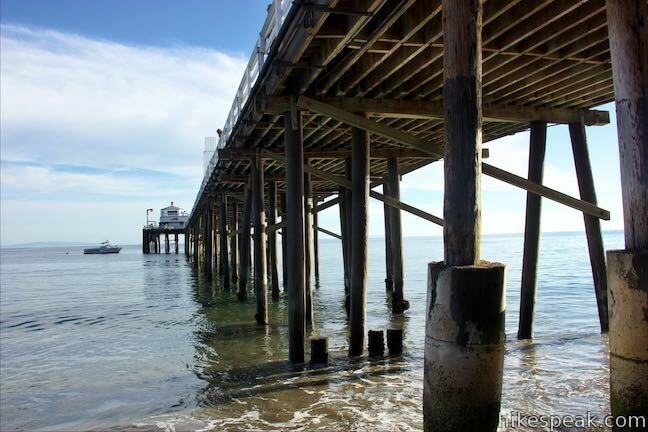 Sinking your toes in the sand, you can make your way east to Malibu Pier. 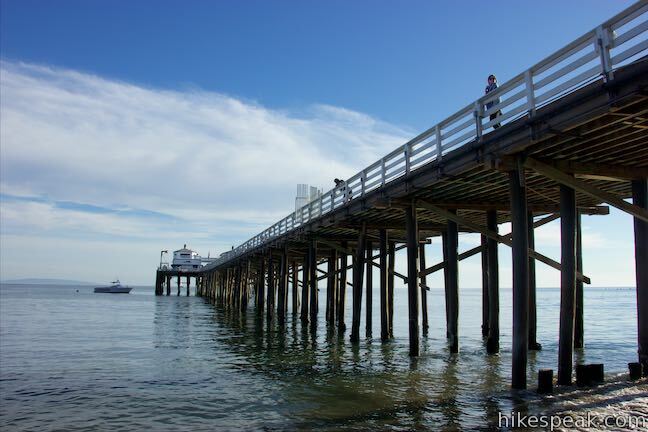 In all, you’ll stretch your legs for about 2 miles on this easy and educational trip to the coast. 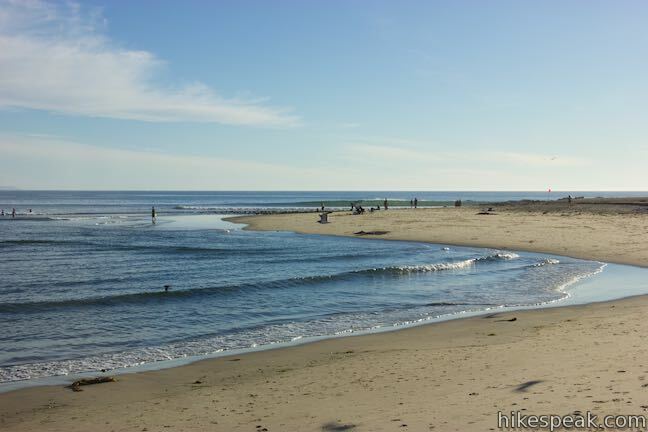 Between 2012 and 2013, Malibu Lagoon State Beach shut down for a restoration project, causing quite a stir. 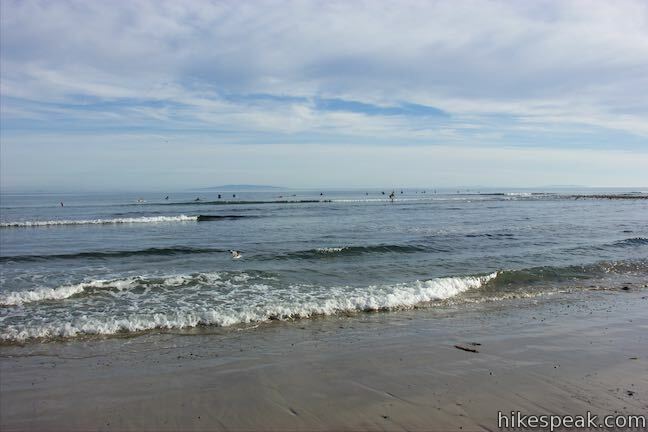 This was understandable, given the popularity of Surfrider Beach. However, if you visit the lagoon following its rejuvenation, it would be hard to call the overhaul anything but a massive success. 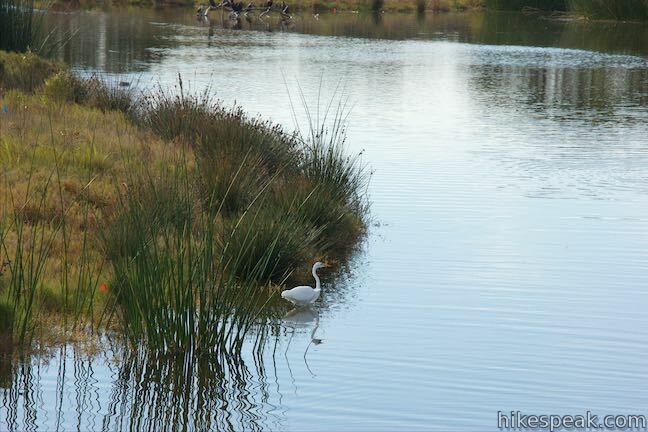 A manicured but beautiful area surrounds an enlarged lagoon that fish and birds call home. 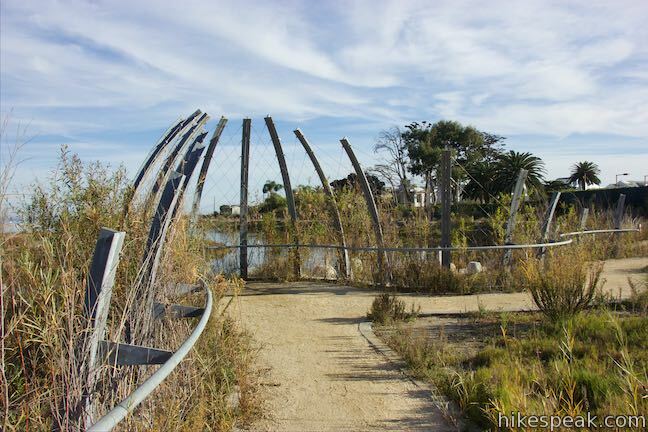 A walkway wraps around the lagoon that is lined by a variety of native plants. 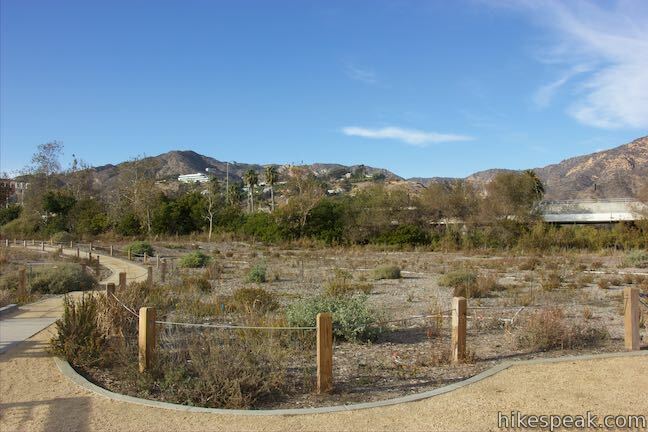 Start from a parking area off Pacific Coast Highway, just west of Malibu Creek and across from Malibu Country Mart (aka Cross Creek Mall). Right at the start, you can walk in two directions. 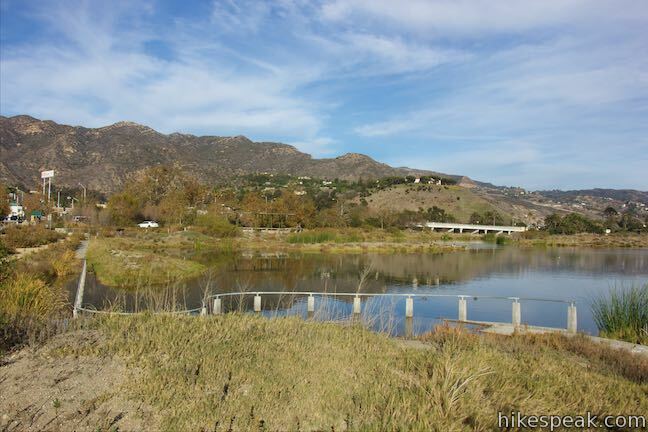 A path to the left is a tenth of a mile long, leading to a viewpoint by the widest part of the lagoon next to Malibu Creek. 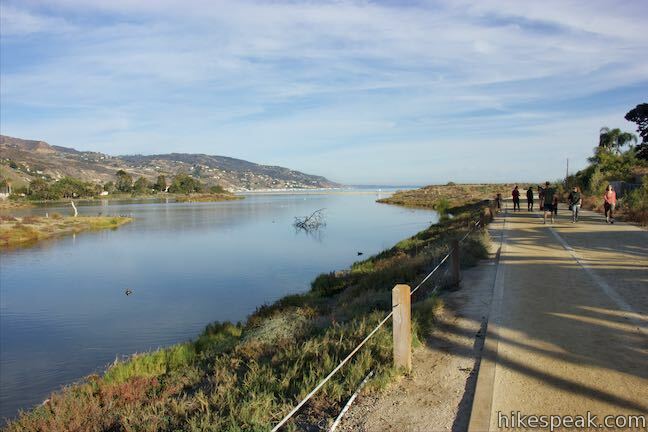 A longer path goes straight ahead and wraps around the lagoon for a quarter mile to another viewpoint and beach access. 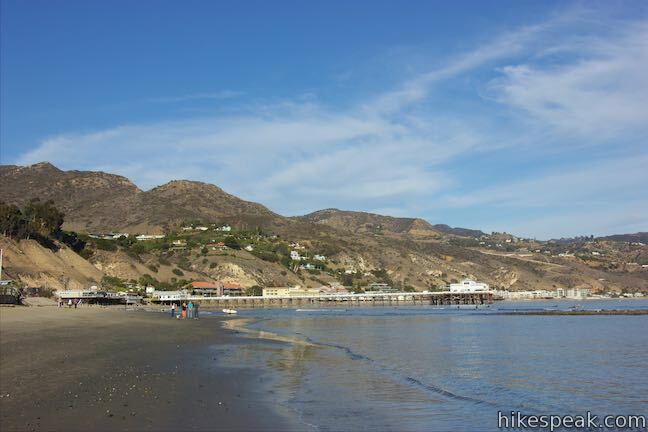 From the end of this trail, you can walk east along the beach for 0.6 miles to Malibu Pier. 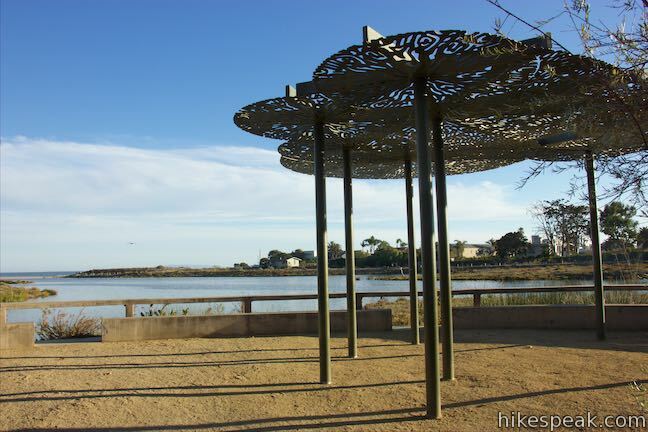 Taking the path to the left, you’ll find wooden benches and an artistically crafted pavilion that offers a bit of shade. 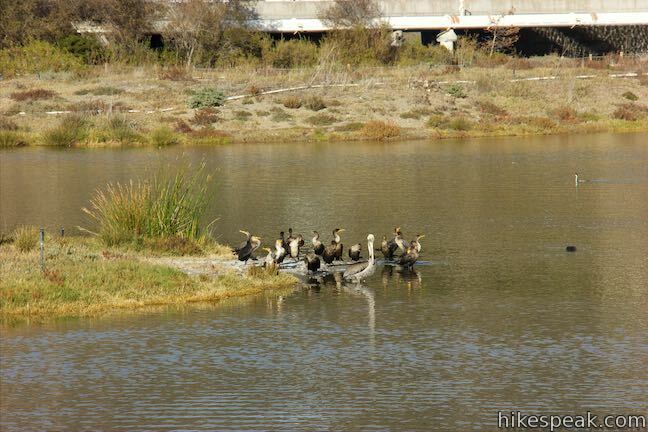 Out in the water in front of you, spot cormorants clustered on a tree branch. 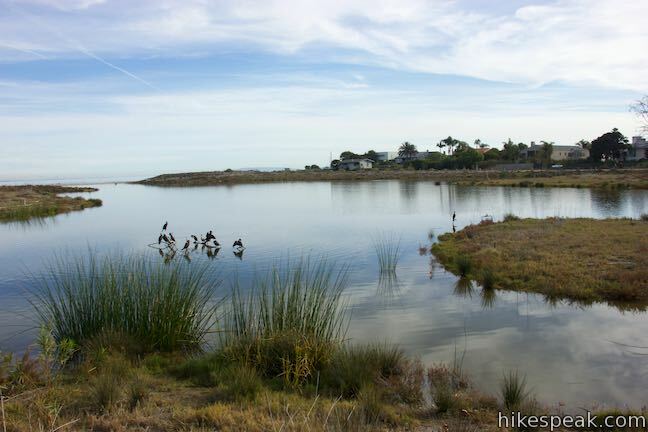 Walk the level path along the edge of the lagoon across from a small island where you might spot egrets among the grasses. 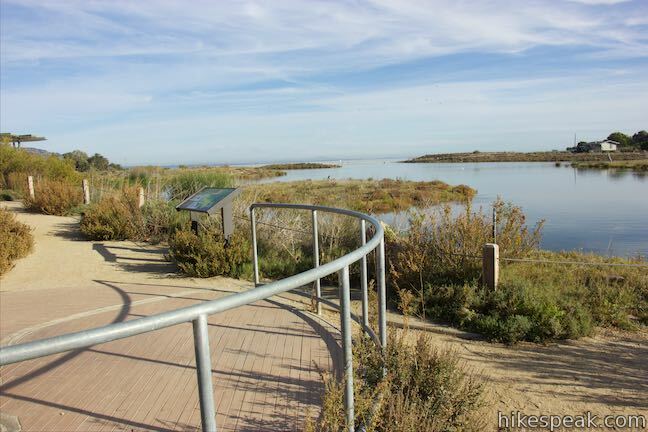 The trail curves to the right and comes to a viewpoint with informative panels and a broad perspective of the lagoon. 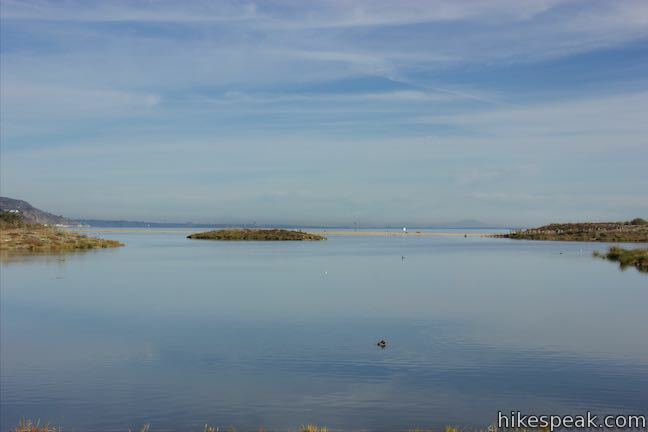 To your right, you can look over islands in the sometimes-tidal lagoon. 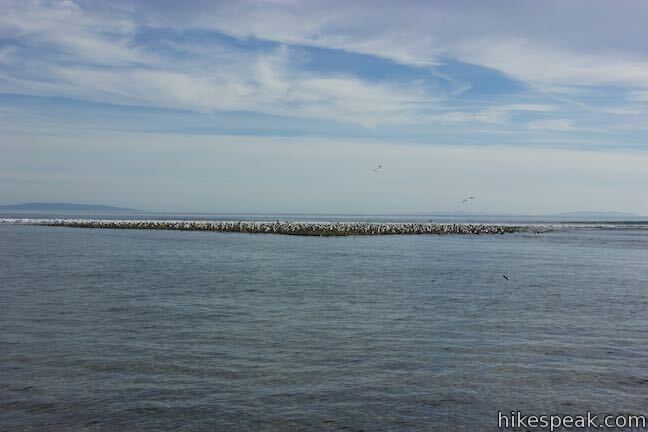 Straight ahead, sea birds cover the water in front of a berm of sand that separates the lagoon from the Pacific Ocean. 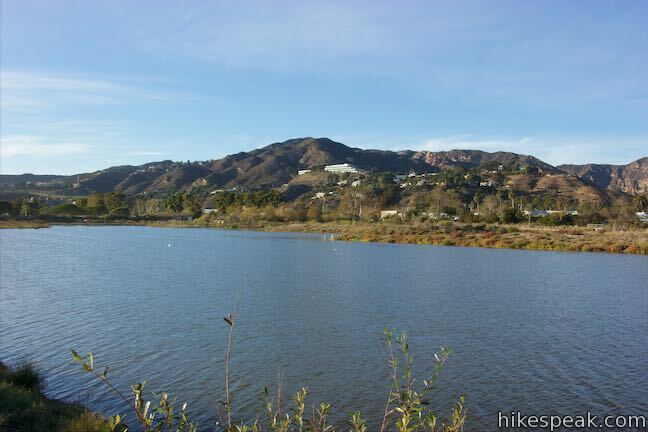 The end of Malibu Creek is to the left, backed by the Adamson House, a landmark home with a large collection of decorative ceramic tile from Malibu potteries. 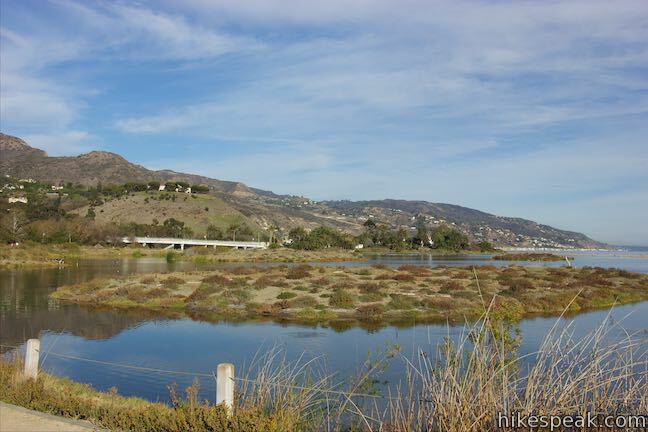 The house is also part of Malibu Lagoon State Beach. 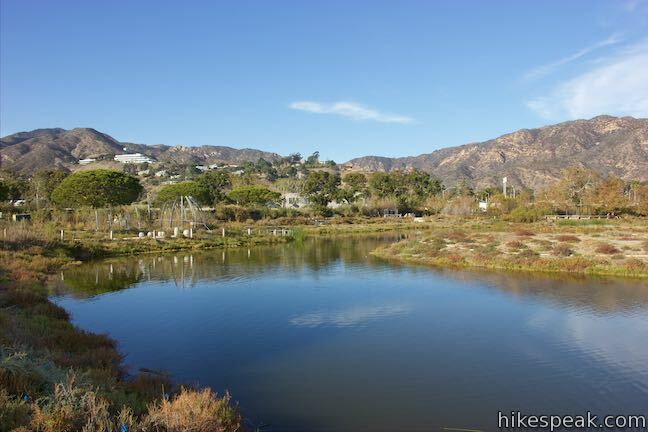 Turning around, you’ll find views into the Santa Monica Mountains that rise over Malibu. 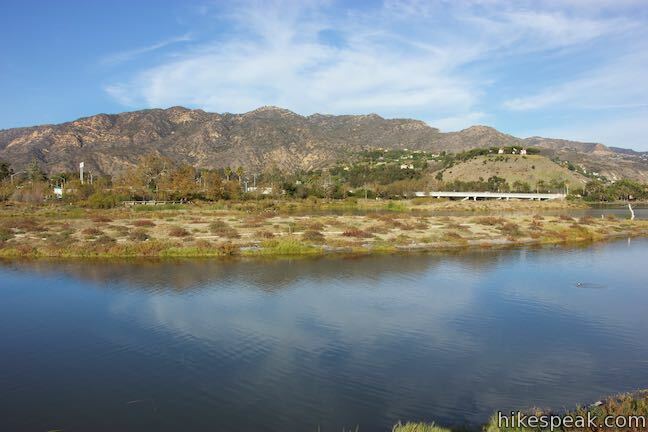 Malibu Creek is the only creek that cuts completely through the Santa Monica Mountains (with a 109-acre watershed), but it still doesn’t always connect to the Pacific Ocean. 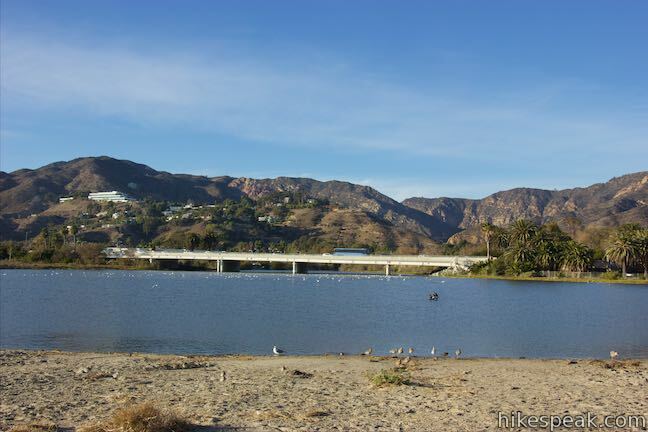 During the dry summer season, creek flow is low and a sandbar builds up between the ocean and Malibu Creek, blocking the creek. 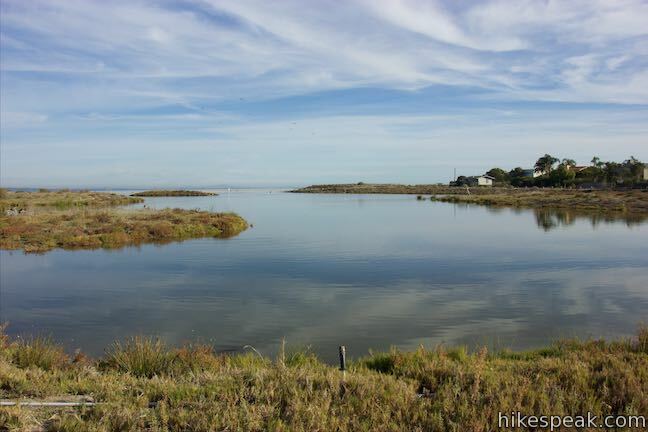 Now cutoff from the ocean, the lagoon fills slowly with water that comes down the creek. In the winter, when the rain comes, the creek swells and breaks away the sandbar. 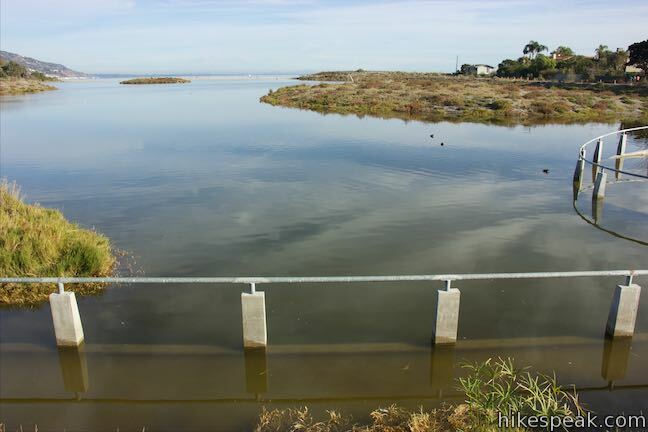 This drains the lagoon and links it to the ocean’s tides. 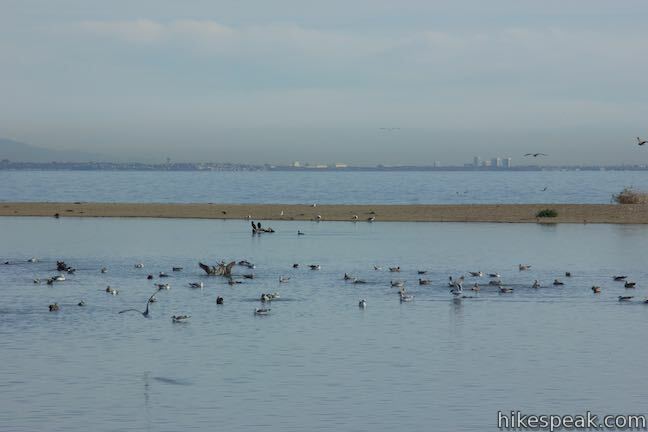 This means that Malibu Lagoon will look different if you visit multiple times throughout the year. 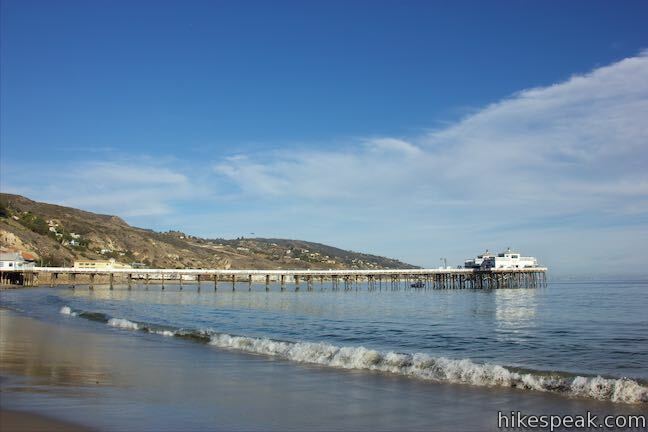 In the winter and spring, it may not be easy to walk along the beach to Malibu Pier. 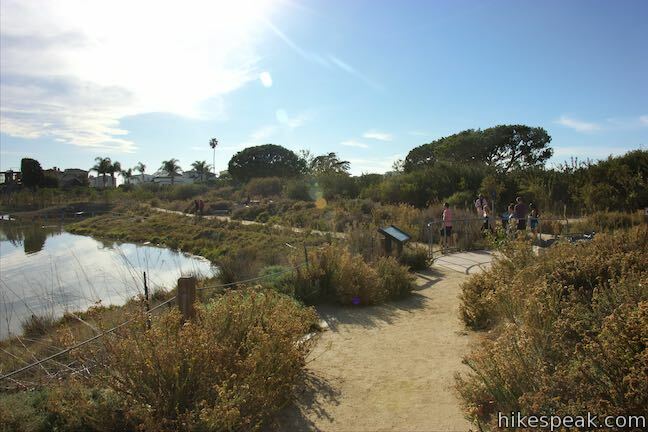 Return to the parking area and start down the other trail, called Surfer’s Express, which leads off with an interesting illustration of the lagoon’s seasonally-tidal nature. 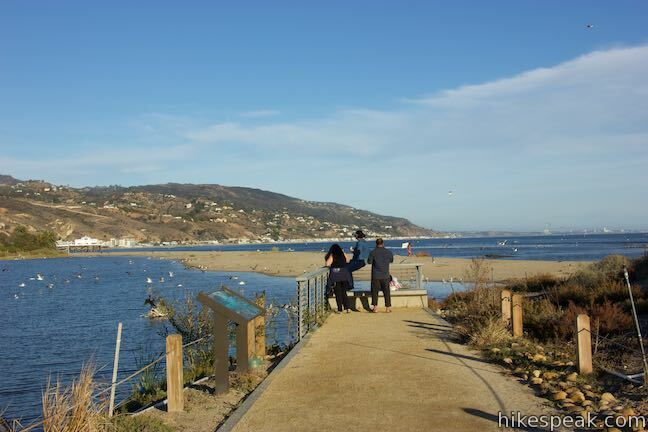 The walkway splits as it leaves the parking area with a level high road and a sloping low road that drops into the water during the summer and fall. 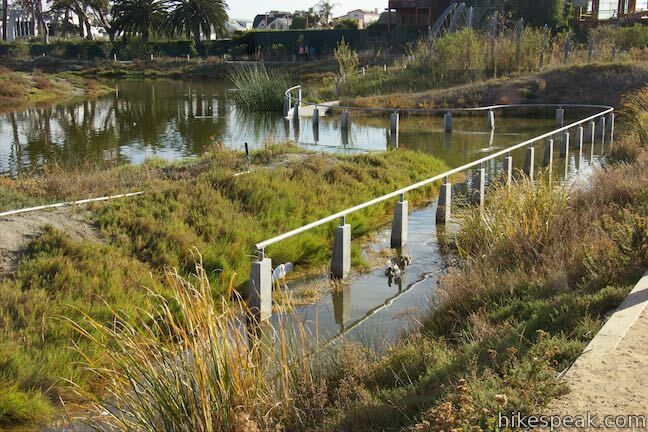 Markers built into the ramp offer a measurement of the water level when the path is flooded. 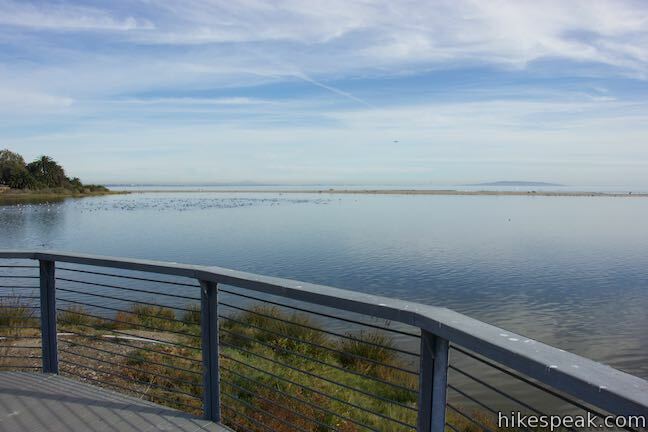 During the tidal season, in the winter and early spring, this wet walkway can be used at low tide. 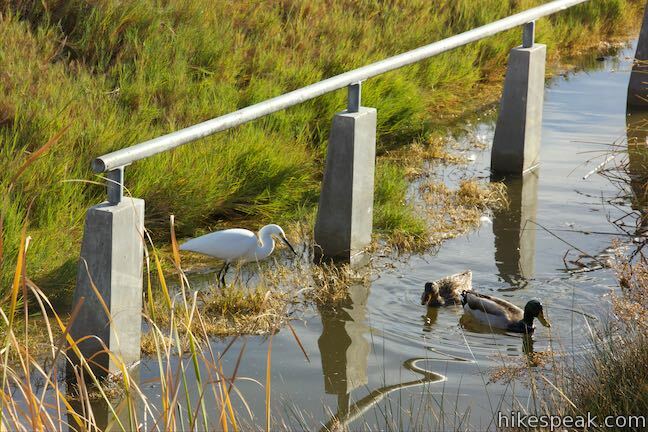 Ducks and egrets seem more likely to use the path during the summer and fall. 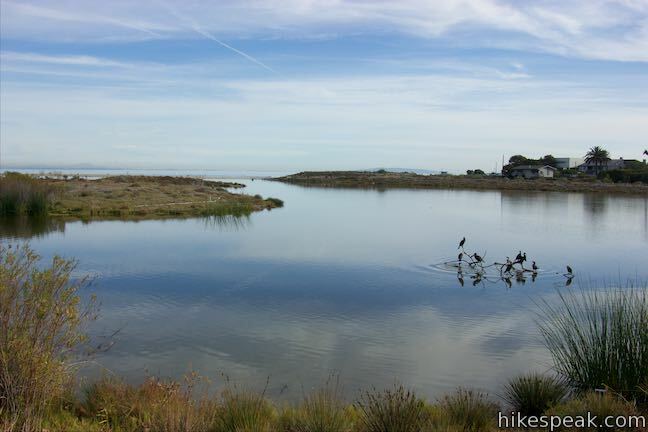 When it is acting tidal, the lagoon exposes mudflats at low tides. 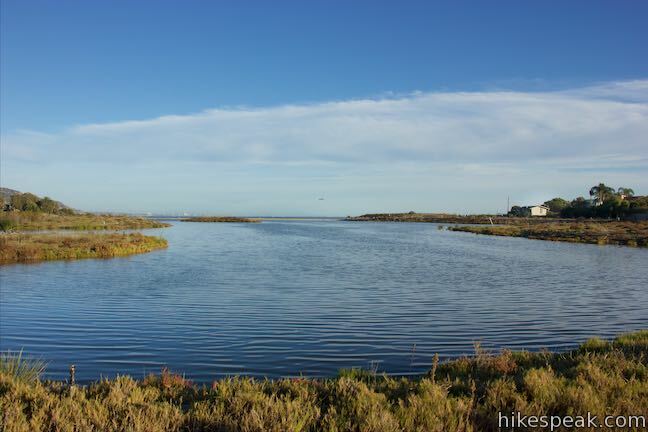 In the summer, water levels rise and increase the surface area of the lagoon. If you stood by the ramp during the winter’s first major storm, you could watch the water level rise to the top of the ramp. 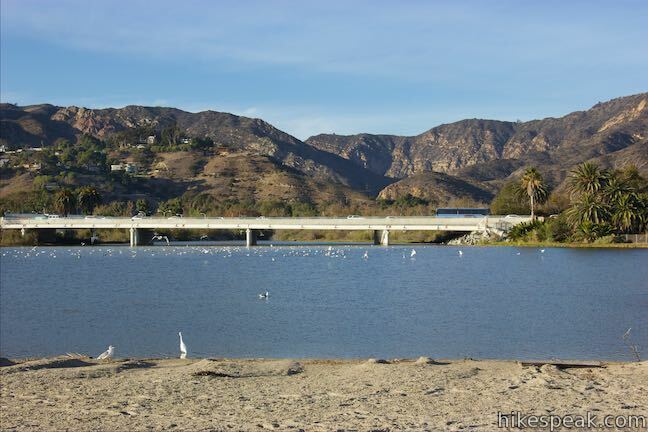 Swollen by rainwater, Malibu Creek would then breach the sandbar, causing the lagoon to empty. 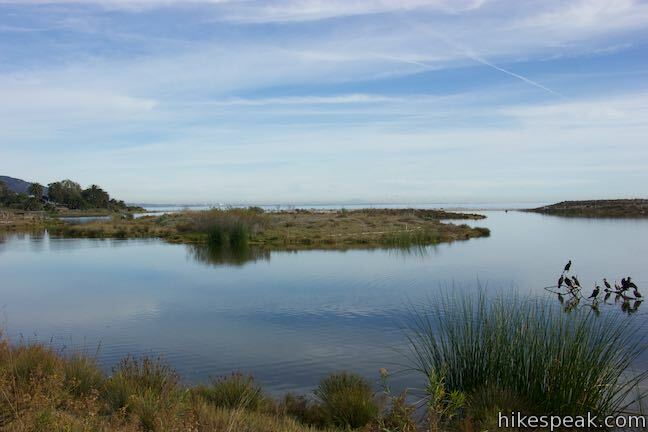 The draining of the lagoon happens rapidly and the surface can be lowed to tide level in not much more than an hour. 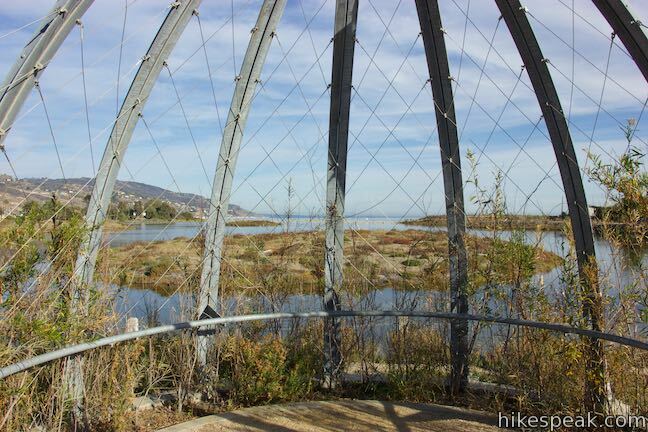 Just past the low-tide path is the Bird Blind, a half-dome shaped steel structure grown over by sandbar willows. 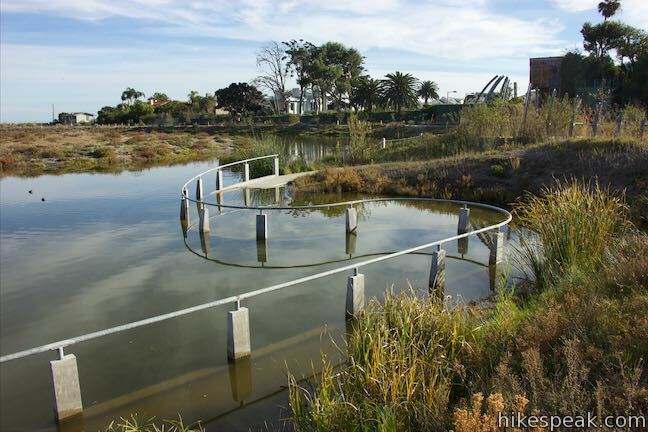 Ahead, the walkway curves to the left by a picnic area and ventures toward the coast between the lagoon and a row of houses. 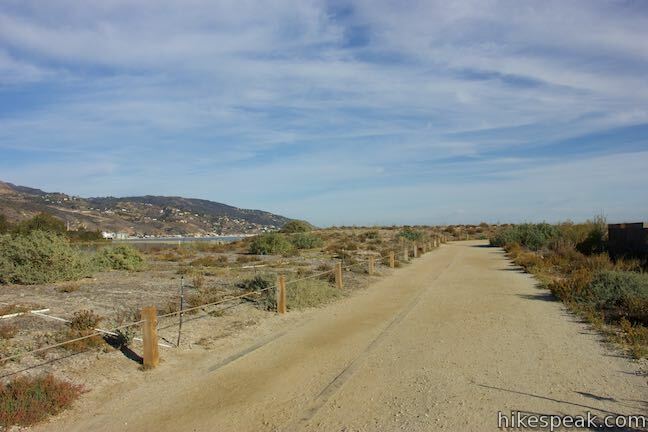 As the trail curves to the right just before the beach, you’ll see a spur on the left that goes out to a second viewpoint, Watershed Overlook. 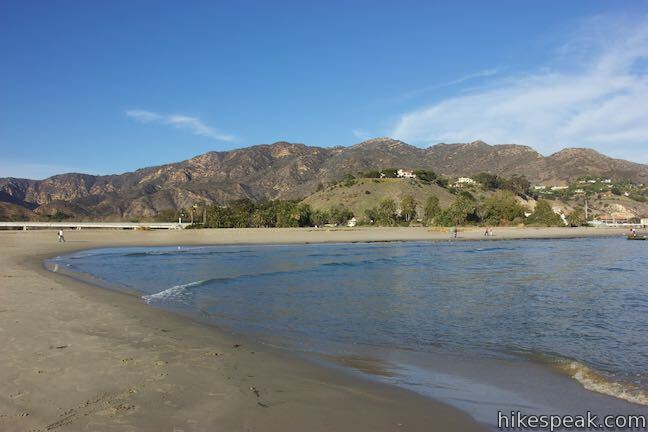 Walk a short distance down this path to an overlook next to the sandbar at the end of Malibu Creek. 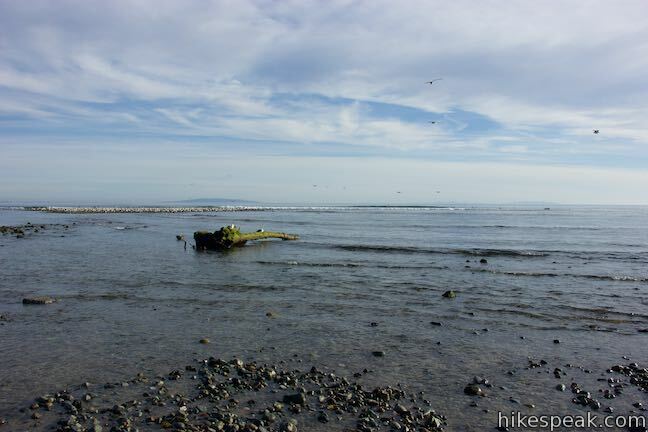 This would be a great place to stand when the creek ruptures the berm and pours into the Pacific. 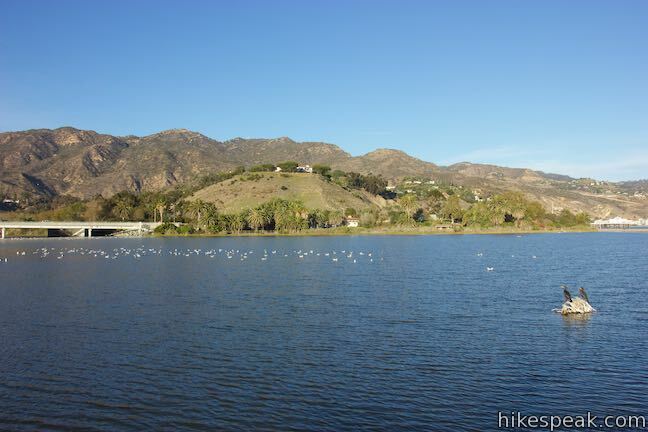 Enjoy a view out over the lagoon and inland up into the Santa Monica Mountains where interesting peach-colored boulder formations stand out among chaparral-covered ridges. 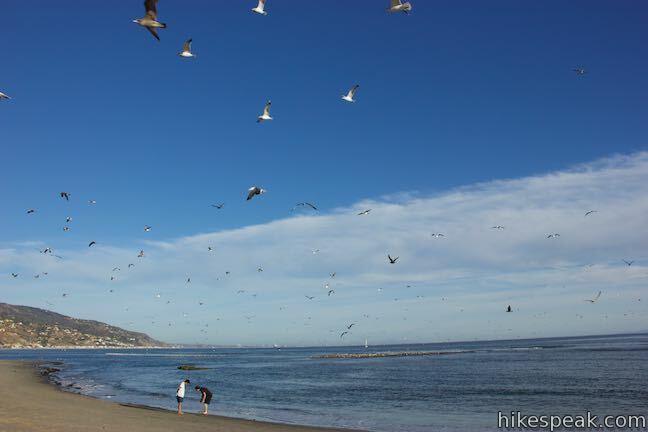 A flotilla of gulls typically occupies the water in front of you, and plenty of other birds will be around too. 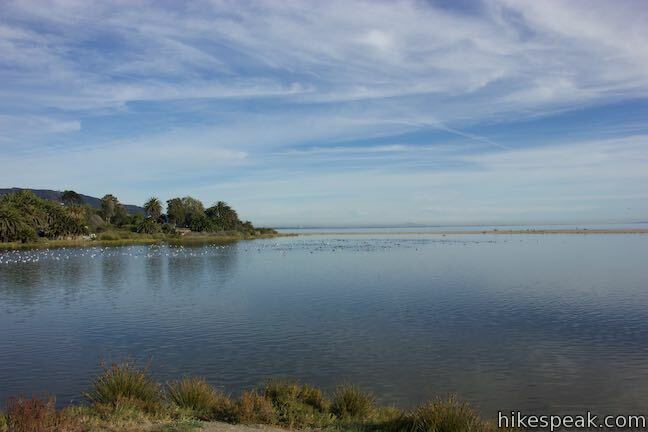 Malibu Lagoon hosts over 75 species of water birds and 70 species of land birds. 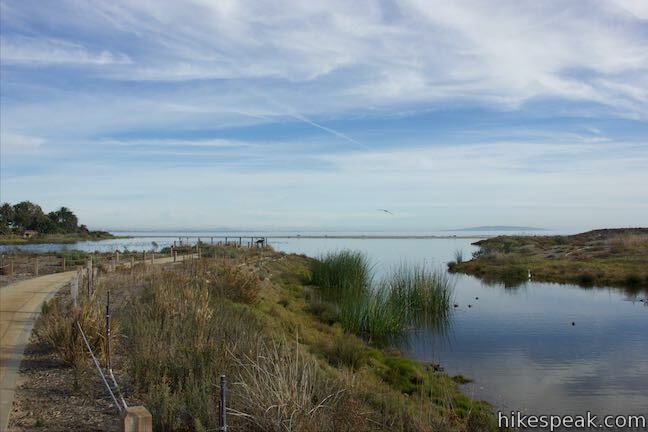 Less than 10% of the original wetland habitats along the California coast still remain, so Malibu Lagoon is a vital estuary along the Pacific flyway, the migratory route along the coast. 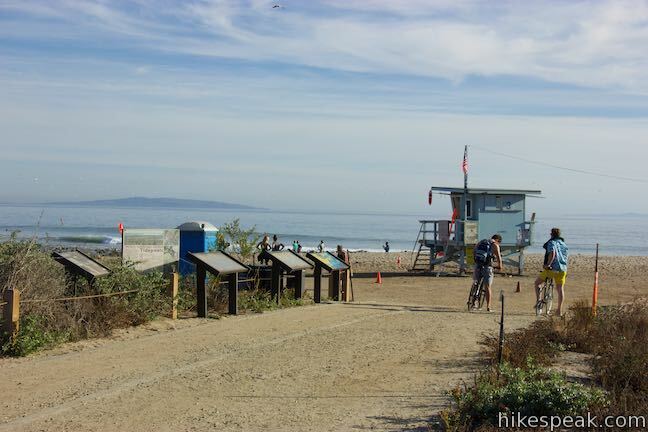 Backtrack from the overlook and continue down the trail to the beach where there is a lifeguard stand and a portable toilet. 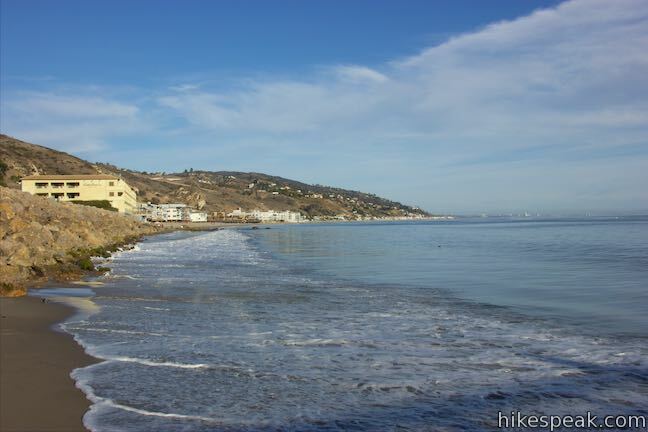 Houses run close to the beach to the right and walking up the coast that way (to the west) may only be practical at low tide. 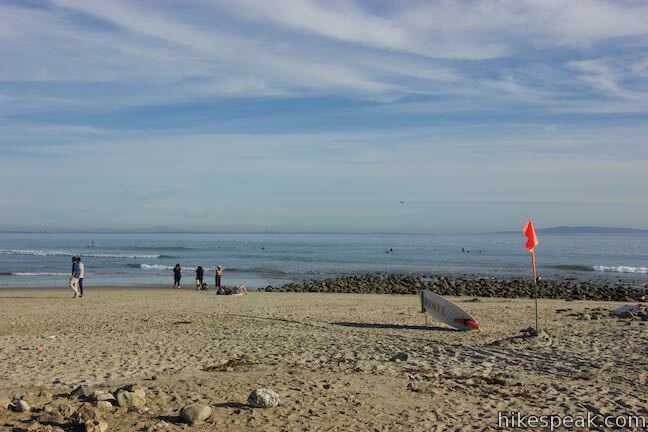 Turn left to explore Surfrider Beach toward Malibu Pier. 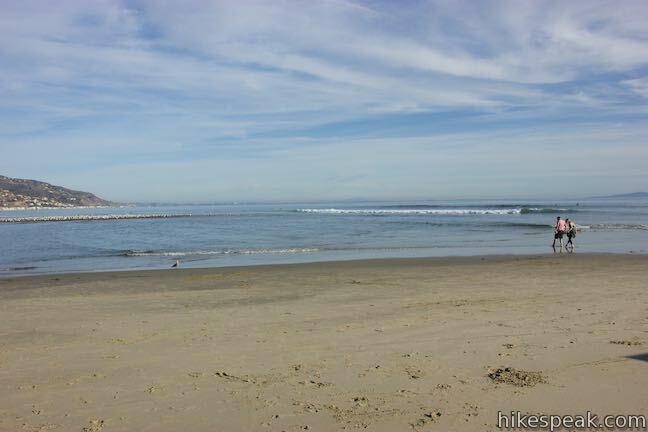 Kick off your shoes and walk across the sand. 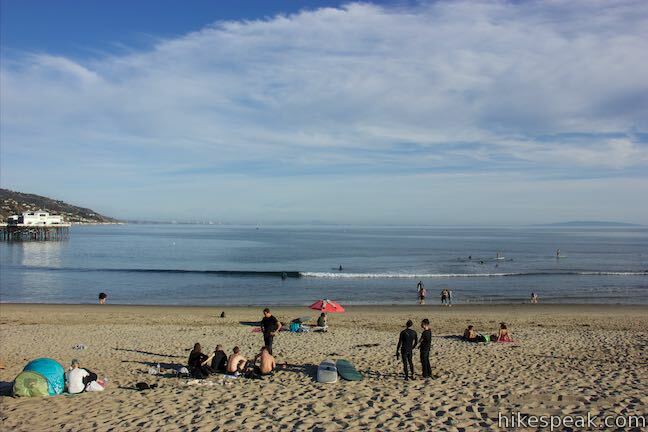 Swimming at the beach is not allowed due to power water quality and heavy surfer usage. 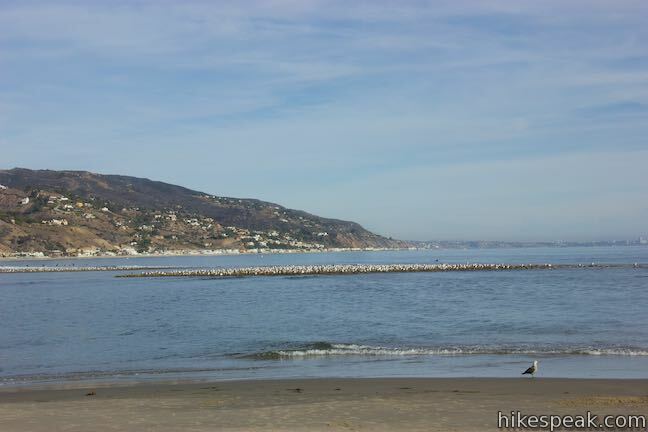 Stroll down the coast along the beach formed at the end of the river. 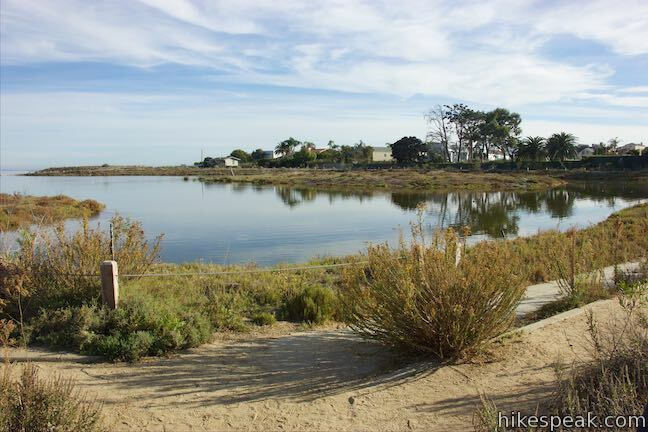 If you walk up into the higher and softer sand on the left, you can look back over the lagoon. 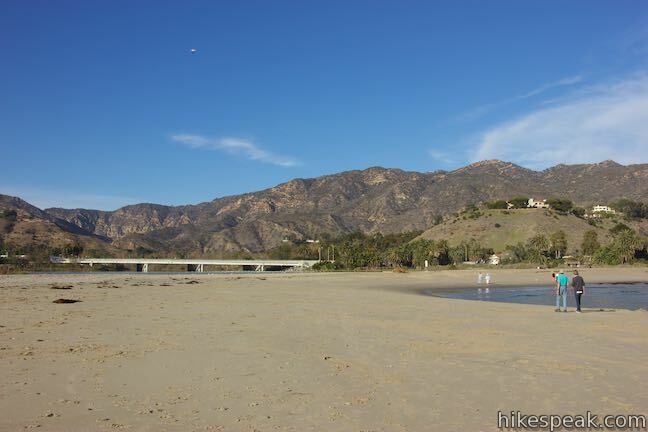 Walk a quarter mile down the beach and cross the spot where Malibu Creek sometimes meets the ocean. In summer and fall, the beach continues across the end of the creek as though it’s not even there. 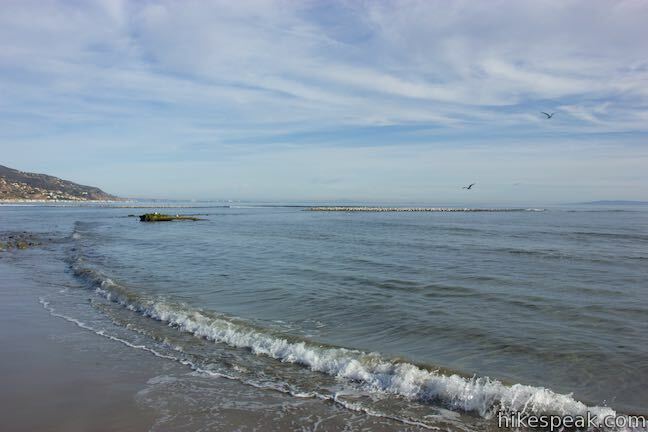 In the winter and spring, the creek splits the beach. 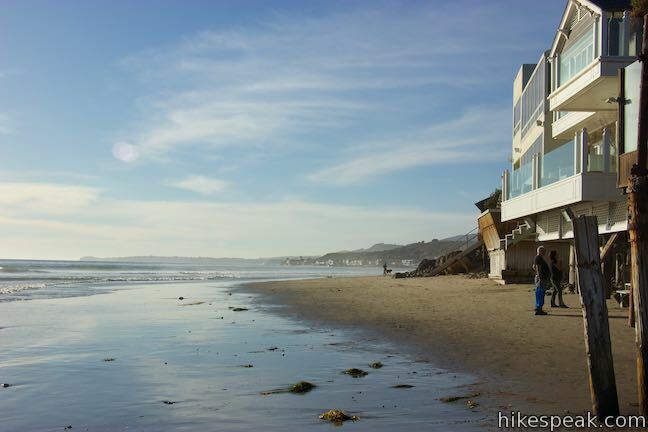 Strolling a little further down the sand, you’ll come alongside the Adamson House. 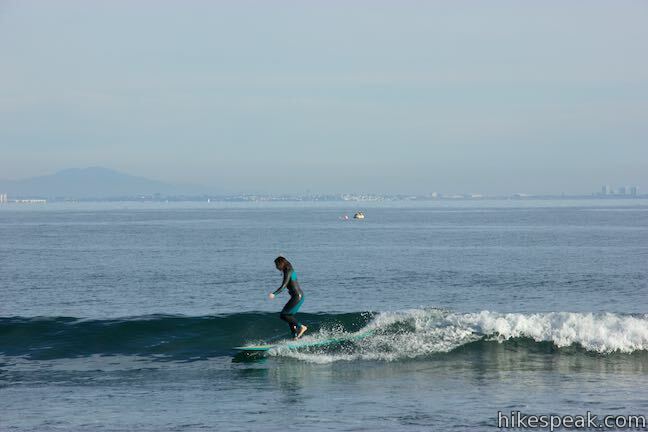 Offshore, you’ll see surfers riding the long waves. 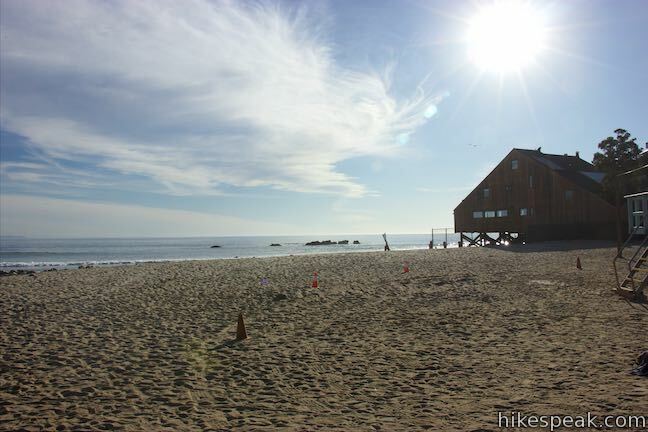 Just past the house, the beach expands with more areas for beachgoers to stretch out. 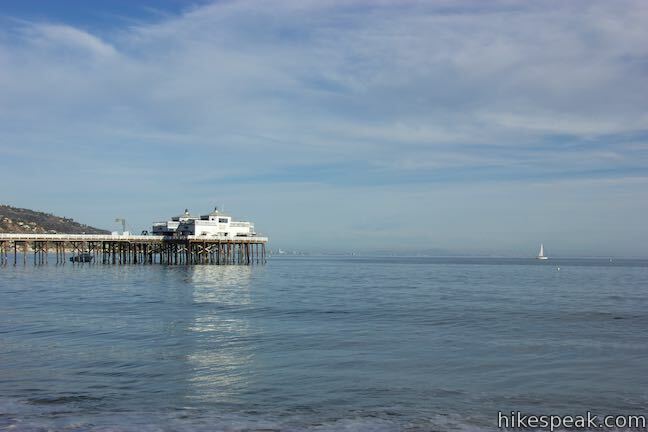 Continue across the beach and pass in front of a row of houses to get to Malibu Pier. 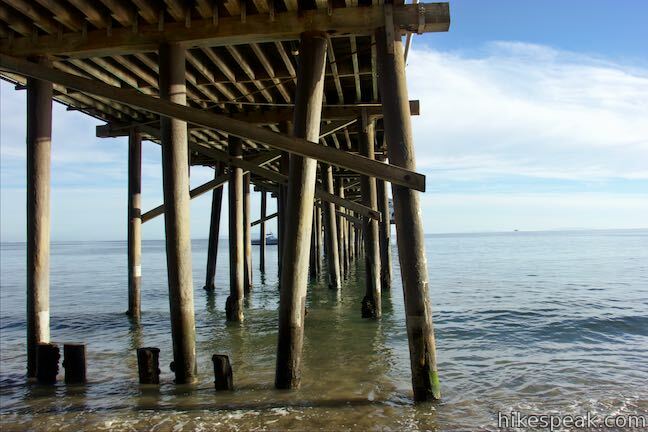 Slip below the wooden columns that hold up the old pier. 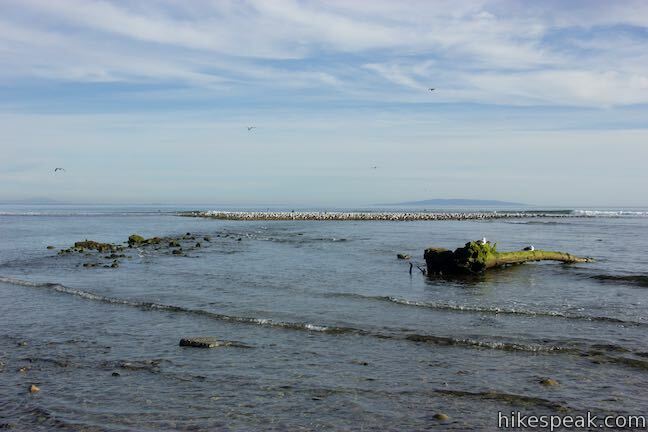 On the other side, the coast becomes impassable when the tide is in, so this is the obvious place to turn around, about 0.6 miles from where the trail met the beach. 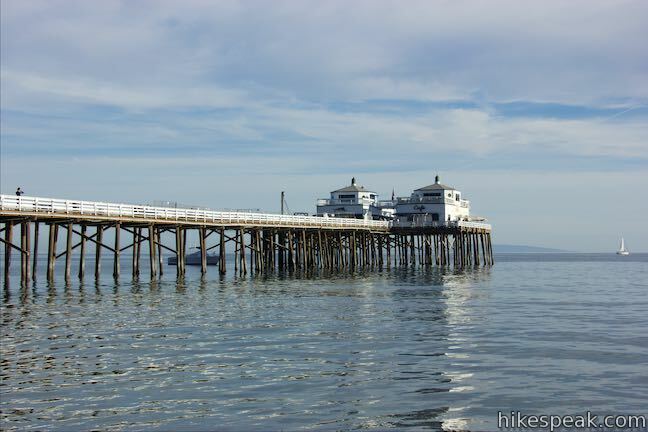 On the far side of the pier, a staircase on the left goes up to the road. 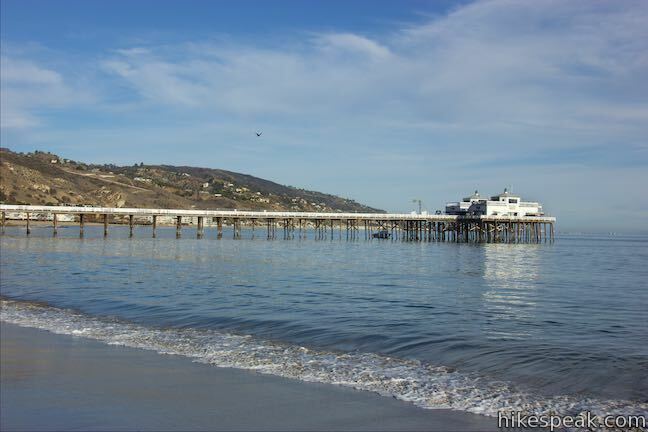 Use these steps if you want to walk out along the pier or return to the start along Pacific Coast Highway instead of the sand. 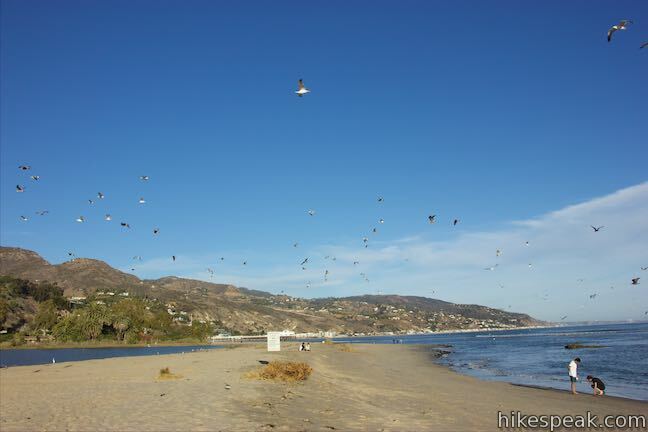 Malibu Lagoon State Beach is a fine fit for bird-loving beachgoers and the 2-mile stroll to the Malibu Pier and the lagoon’s viewpoints makes for an easy activity. 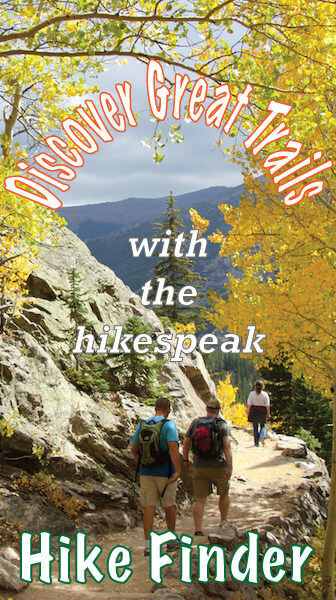 A $12 day use fee is required to park at the trailhead (as of 2015). Roadside parking outside the park may also be available for those willing to walk further. 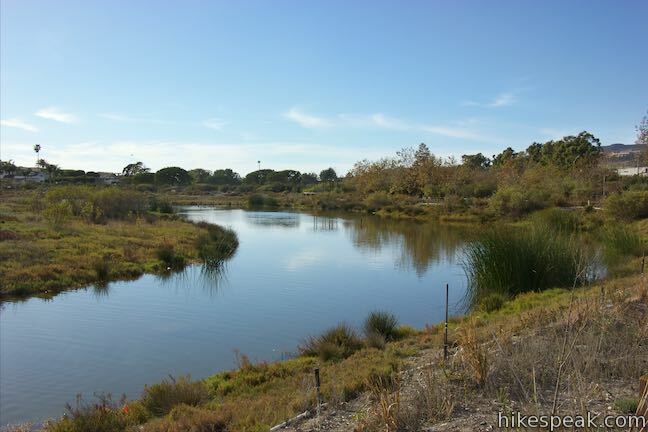 Portable toilets are located at the parking lot and at the end of trail. 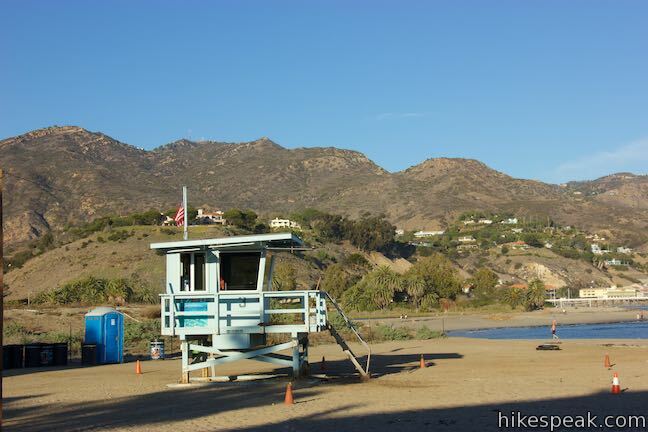 The beach near Adamson House has a real bathroom. 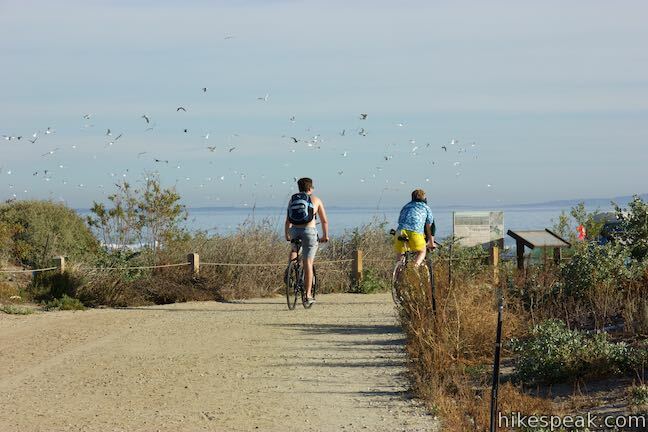 Bikes are allowed on the trail, but dogs are not. 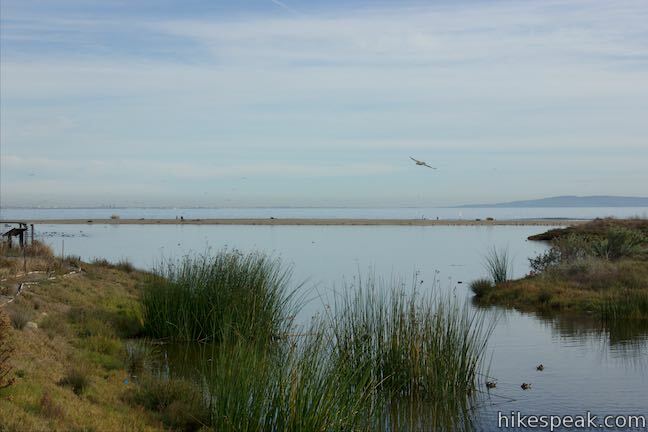 No permit is required to hike in Malibu Lagoon State Beach, so get out and enjoy! 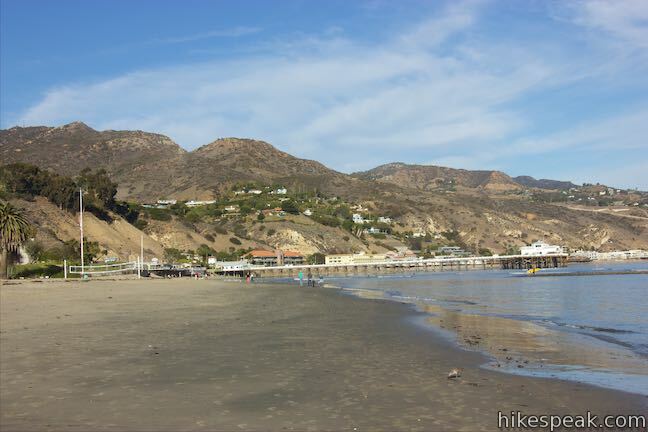 To get to the trailhead: Take Pacific Coast Highway to Malibu and turn south on Cross Creek Road (where there is a traffic light). 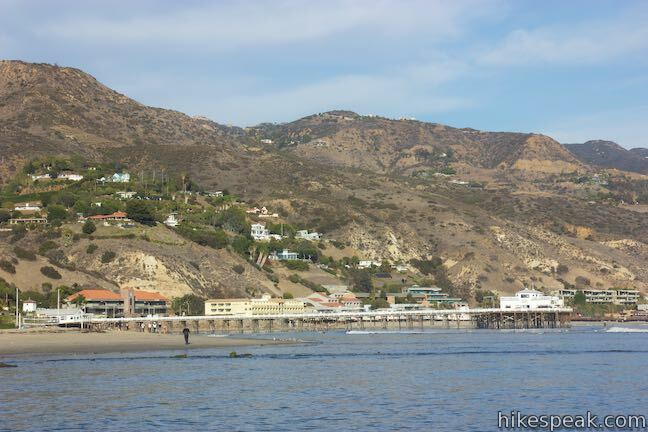 Cross Creek Road is 12 miles west of the 10 Freeway in Santa Monica and one mile east of the intersection between PCH and Malibu Canyon Road. 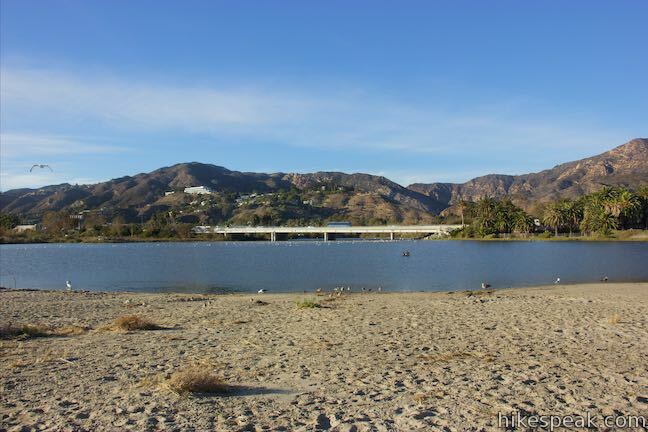 Turn into the parking area for Malibu Lagoon State Beach, which is just across from the mall and just west of the bridge over Malibu Creek. 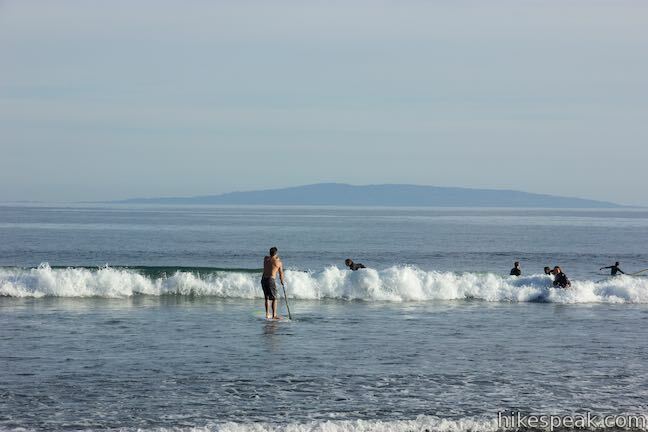 These photos were taken in December of 2015. Click to enlarge.